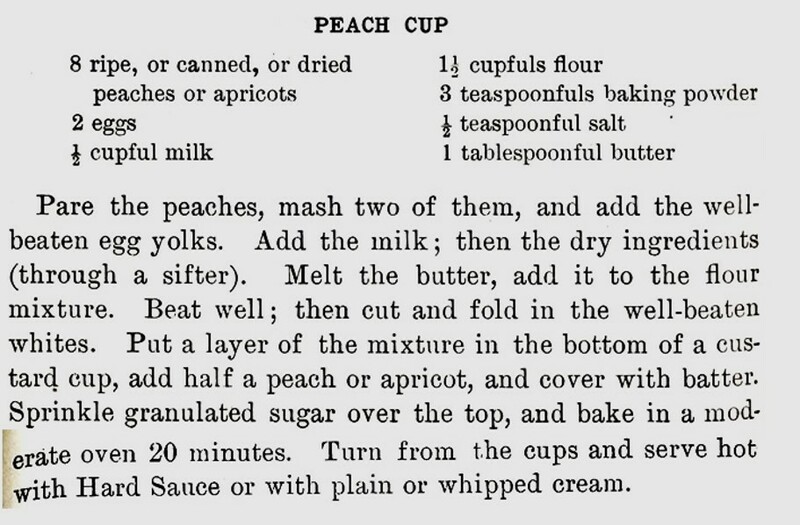 I always think of peach season as cobbler season, so I was excited when I saw a hundred-year-old recipe for Individual Peach Cobblers. The cobblers are delightful when served warm with whipped cream or vanilla ice cream. These cobblers are a double peach dessert that contains both sliced and mashed peaches. Hot juicy peach slices are embedded in this homey cobbler; and mashed peaches, which are mixed into the batter, infuse the cobbler shortbread with a light peachy sweetness. This dessert was called Peach Cup in the original recipe. In the early 1900’s, individual cobblers and shortcakes were called cups because they were made in custard cups or muffin pans. Preheat oven to 425° F. Prepare custard cups or jumbo muffin pan by generously greasing the cups. Peel the peaches, then mash 1 peach (3/4 of a peach if using large peaches). (I used a blender to puree the peach). Set aside. Slice the remaining peaches. Set aside. In a large mixing bowl combine the flour, baking powder, salt, egg yolk, milk, melted butter, and mashed/pureed peach. Beat until smooth. Gently fold in the egg white. Place in the oven, and cook for 20 minutes or until lightly browned. Remove from oven and cool for about 5 minutes, then remove from cups. To remove from cups, run a butter knife gently around the edge of the cups, then turn upside down on a plate. After the individual cobblers slide out of the cups, flip them so they are upright. Best when served warm. May be topped with whipped cream or vanilla ice cream. Cook’s note: Canned or frozen peaches could be substituted for the fresh peaches. Notes: I divided the recipe by 2 when I made it. The original recipe called for using peach halves, but my peaches were too large to fit in a custard cup, so I cut the peaches into slices. Posted on July 24, 2016 July 26, 2016 by SherylPosted in FoodTagged cobbler, peach, recipe. Previous Previous post: Should We Eat Candy? Very interesting! I might try this one. I keep trying to make the peach cobbler that my mother made but have not been able to duplicate it. I have to make peach cobbler at least once in the summer with Blue Bell Homemade Vanilla ice cream. Your “cups” look delightful! I think that you’d like this – though it may not be what your mother made. I don’t know about your mother, but my mother’s recipe called for cinnamon. My Apple Crisp recipe calls for nutmeg, but nutmeg with peaches is new to me. It’s interesting how different traditional family recipes call for different key ingredients for the same dish. See? Cinnamon is for apples in my family! It is. 🙂 I didn’t try it with vanilla ice cream, but I really liked it with the whipped cream. You’re welcome. I think that you”ll like it. Oh goody. We have a peach tree, so I’ll put this to use when our summer comes. Thanks. Such a great find! I love the idea of individual cobbler and the addition of mashed peach to the batter. I also was fascinated by how the recipe called for the mashed peaches in the batter. I never would have thought of doing that, but it added a really nice flavor and a bit of sweetness without any added sugar. Yes it’s really a great idea! I’m going to keep this one.. Perfect for me to make when it is just the three of us at home some nights. It is hard to learn to cook little amounts when I have been used to cooking for nine or more for many years ! I think that you’d like it. It’s got to be a big change to go from 9 to 3. My kids haven’t lived at home for quite a few years – but I remember how much more I needed to make back then. This sounds worth trying. I have ripe peaches too. It’s delicious. I recommend topping it with whipped cream or vanilla ice cream. The creaminess of the topping transforms a good dessert into a wonderful dessert. The individual cobblers worked out really well. I worried that I would have difficulty getting them out of the custard cups in one piece, so I greased them generously; but I didn’t have any problems. Oh, peach season is the BEST season. These just scream wonderful summer to me! I’ve been enjoying peach season too! I’ll have to try this recipe. It looks great. Sheryl, do you suppose this was one of the items that too-ripe fresh peaches was used for? Also, I didn’t see where the recipe came from. I always find that interesting – which cookbook or magazine. Thanks for letting me know that I forgot to include the source of the old recipe. I added it in a caption beneath the recipe. It is from A Text-book of Cooking by Carlotta C. Greer (1915). I find hundred-year-old home economics textbooks fascinating. They generally contain lots of fascinating information, as well as good, well-tested recipes. I can almost picture a class of students making this recipe. There’s lots of tasks involved that could be divided across the students, baking times would be shorter than for a large cobbler, and the individual servings would be perfect for the students to eat. Thank you! My mother taught home economics to junior high and high schoolers in the 1950s and 1960s. Her teaching degree was in 1952. Not a hundred years ago, but what you post reminds me of some of her cooking and things she said she learned from her grandma. Too ripe, very soft peaches should work just fine. They would mash easily, and since the cooking process softens the fruit anyway, it won’t matter that they were very ripe. Those sound very good, and certainly worth trying! To me, peaches are there for the eating, just as they are, juice dripping down my chin. Can any of you commenters tell me what the appeal of cooking with them is? It feels as if they’d simply turn into hot tinned peaches. Obviously, all of you feel differently … so what am I missing out on? You’re right that there would be little difference in taste or texture if canned or frozen peaches were used in this recipe instead of fresh ones. For some reason I don’t even think about cooking with peaches when they are out of season. I’m not sure why. It’s my loss that I don’t make peach desserts year-round. I don’t quite know how to describe it, but fresh peaches in pie or cobbler are splendid. I think they’re a little more tart — and they maintain their peachiness more than canned peaches ever could hope to. I did just realize that I never, ever use a grocery store peach, though. If I can’t use tree-ripened peaches, I don’t even bother. Lucky you! No chance whatsoever of that in England, I’m afraid. I do envy you. I love how you print the original recipe and update it for the current times. The peach cobbler looks delicious and it’s surprising that they did individual portions 100 years ago. The original recipe appeared in a hundred-year-old home economics textbook. That may be one reason why this recipe was for individual servings. Individual servings would cook more quickly – and would work nicely to give each student a taste of the dessert. I like peaches fresh, too, but wouldn’t this recipe work well for berries or apples? I love the look of the individual servings! Yes, it should work just fine with berries or apples. I might add some cinnamon if I made it with apples. Another amazing recipe! Someday I hope to have the time to try a few. I have a lot of fun trying old recipes. I think that you’d enjoy making a few of them. I’m thinking of the peach cobbler for a barbecue I’m going to this weekend. I don’t have individual cups. Do you think it would work in something larger? I think that it would. The baking time, and maybe the temperature, would probably need some adjustment if it all was put into one dish. The time would be longer, and I might have a tendency to use a slightly lower temperature so that the edges wouldn’t get over-browned before the center was thoroughly cooked. If you make it, let us know how it turned out. I’m always curious – and it’s so helpful to other readers to have additional information if they are thinking about trying a recipe. I didn’t know cobblers could be made in individual servings. This is a wonderful discovery. Thank you for sharing this recipe. It sounds like a delicious treat, especially with ice cream or whipped cream. Yummy! This was the first time that I’ve ever seen a cobbler recipe for individual servings – but it worked out well. I’ve even tempted to try making my normal peach cobbler recipe in custard cups. Now this is a recipe that will NEVER go out of style. 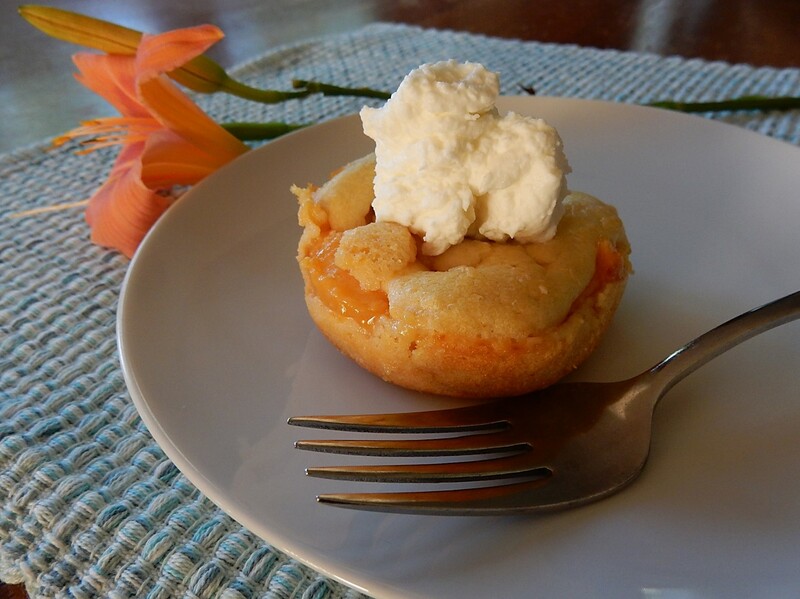 I love peach desserts and serving them this way is so wonderful! I agree! Peach cobbler is a classic – though the individual servings seem like a new twist (or perhaps an old twist) to me. I think that it would work just fine – though you’ll probably need to adjust the time and temperature. If I was making it in a larger pan, I think that I’d reduce the temperature a little (maybe to 375 or 400), and of course it will need to cook longer in a larger pan. I believe I’m going to give it a try. I’ve got a pile of peaches, and my freezer’s nearly full — it would be fun to try something new instead of the cobbler I was contemplating. This is a wonderful, delightfully eye-pleasing dessert. I can’t wait to try it. It is an attractive dessert. I think you’ll enjoy it. This looks wonderful and I love mini desserts! They look delicious. I will make them today! They sound delicious and I have all the ingredients, minus the very important whipped cream. I think I will try it. Welcome! I think that you’ll enjoy this recipe.